Crime and gang violence can make life in the inner city feel like a war zone. I have a crime map of a two-mile radius of my inner city neighborhood that the police gave me. A murder map hangs on the wall of Abide’s headquarters representing every person killed since 1991. Red pins cover the map, bleeding primarily over north Omaha. After more than 15 years of tireless effort, the constant needs in the inner city overwhelmed me. By 2007, housing issues alone seemed daunting. Over 3,200 properties were considered condemned while countless others had code violations or abandoned and uninhabitable. When owners don’t maintain their homes, care for the community diminishes and crime flourishes. Police call this the “broken window” effect because unmaintained neighborhoods and condemned houses become havens for drugs, gangs and violence. The concept was simple. Love our neighbors in practical ways by getting out of the seats and cleaning up the streets. With this small beginning, Bridge Church partnered with Abide to refocus our mission and begin with a grassroots neighborhood approach. Bridge Church targeted two crime-ridden neighborhoods for its first efforts at revitalization. Two houses—just blocks apart—quickly became the focus when we bought the properties in the summer of 2008. With the help of an army of volunteers, the houses were gutted and remodeled. Before the transformation, graffiti covered the walls and drug syringes littered the Fowler house which had been abandoned for 13 years. This house served as a catalyst for change in the neighborhood. With each improvement to the house, one neighbor after another emerged from the surrounding houses. Neighbors began to watch out for each other. The transformation of just one home brought dramatic change to the entire neighborhood. The Larimore house mirrored the same effect. Picking up trash, mowing empty lots and fixing abandoned properties caused a decrease in crime in these two neighborhoods, and the police took notice. When officers asked the neighbors what happened, they pointed to our home which also housed the church and nonprofit offices. As a result, the lighthouse concept was born. When the Fowler house neared completion, a family from Bridge Church was recruited to live in the lighthouse and become an advocate for the neighborhood. Two houses seemed like a small drop in the bucket, but the benefits have been priceless. 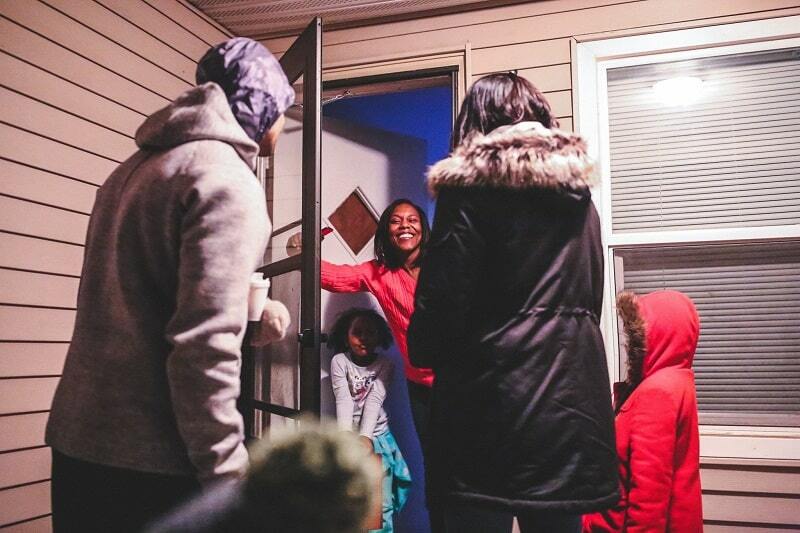 Crime has dropped in these neighborhoods, and residents are empowered to change their neighborhoods and connect with the church in ways they never thought possible. Now we’ve targeted 700 neighborhoods, each with an average of 25 houses or 50-100 people. To date, we’ve refurbished 41 lighthouses and adopted 205 neighborhoods. The community is being revitalized and people are coming to Christ. Transforming neighborhoods doesn’t happen in a day. Transformation happens daily. The constant presence of lighthouses in neighborhoods builds a culture of love that changes lives. Lighthouse families establish permanent roots in the inner city community, living out their faith and modeling a healthy lifestyle based on God’s principles. Doing life together is the heart of culture building. Zeke and Jeremy, 11-year-old twins, are proof of this life change. When the lighthouse leaders first met the brothers in 2011, their mother would not allow them to open the door, so they left a plate of cookies at the front door. Over the next several years, the lighthouse leaders connected with the twins through music and skateboarding. Finding common ground immediately built a level of trust with the boys. Soon the brothers began to stop by the lighthouse to hang out, get a ride to Bridge Church, play piano or guitar, or join the leaders for a weekend lunch. This led to a connection with the boys’ parents and an invitation to the twins’ birthday celebration. The same connections happened as my wife and I opened our home to kids in our neighborhood. We’d take several vanloads to church, then bring the group home for Sunday dinner. Soon our house was brimming with 60-80 kids every Sunday afternoon. Some of our kids’ best friends hung out at our house so often, they became a part of our family. Kaveon, one of the regulars, told me coming to our house was like going to Disneyland because we shared meals and had a lot of fun together. Amazing, isn’t it? God can use the simplest gestures in powerful ways. Mowing a yard. Cleaning up trash. Sharing a meal. A simple plate of cookies. When we build a culture of love with relationships at the center, lasting change occurs. Small acts of love make a big difference. What simple gesture can you do for your unchurched neighbor? Maybe this small act will open a door to invite them to church. One person acting as a lighthouse can transform a neighborhood. Only God knows the power of the ripple effect. Ron Dotzler left the field of engineering in 1989 to move to the inner city with his wife, Twany, and their family. Putting a new spin on Jesus’ commandment to love your neighbor, they founded Bridge Church and its nonprofit partner, Abide, to put the neighbor back into the hood by adopting one inner city neighborhood at a time. Ron’s first book, Out of the Seats and Into the Streets is available on Amazon. Ron’s next book will be released in July 2018. Find out more: www.outoftheseats.com. Check out this article I found at City Gospel Movement's website https://citygospelmovements.org/resource/on-a-mission-to-adopt-700-neighborhoods/. The Lighthouse Concept builds a culture of love by keeping relationships central. Small acts make a difference when adopting neighborhoods.